Advanced Geomantic Techniques from Serena Powers. You will find More Advanced Geomantic Techniques described below including The Reconciler, The Way Of the Points, the Part of Fortune, The Projection of Points, the Qualities, the Four Triplicities, Occupation, Conjunction, Mutation, Translation, Astrological aspects, the Company of Houses, and what to do if the Reading makes no sense at all. If the Judge is not clear then a figure called the Reconciler (also known as the Sentence, Super Judge, Subiudex, Subjudex, Fate) can be created by adding the First Mother and the Judge to add clarity. This new figure shows how the ultimate outcome of the question will affect the querent. You can also create the Reconciler from the figure located in the House that is relevant to the quesited (the issue in question) together with the Judge. For example, for questions involving the partner, reconcile the figure in the Seventh House with the Judge. This new figure shows the way the querent and the quesited interact. A less common alternative is to make the Reconciler from the Judge and the First Witness. Look at the top line (head) of the Judge and note if it is one point or two points. Then look above the Judge to the Witnesses and see if any of them have the same top line. Keep moving up the shield until the top line differs. You may find there are multiple paths. The path may be very short or go all the way up. The Way of the Points reveals the driving force or the root cause of the question. The figure or figures where the path ends reveals this hidden information. If the the Way of the Points cannot be formed, then this indicates that the situation is exactly as it seems. Add up all the points of the first 12 figures. Divide by 12. The remainder indicates the House where the Part of Fortune falls. A remainder of 1 indicates the 1st House etc etc. A remainder of zero indicates the 12th House. This house and the figure contained within it reveal ready money or cash belonging to Querent. This figure is important in all questions of money. Count how many single points there are in the first 12 figures of the chart, divide by 12 (or subtract 12 again and again). The remainder indicates the House that contains the hidden factor. A remainder of 1 indicates the 1st House etc etc. A remainder of zero indicates the 12th House. This house and the figure contained within it reveal the hidden factor in the situation. Eight of the figures are described as Stable and eight are described as Mobile. Stable can also be called Direct or Entering. Mobile is also known as Reverse or Exiting. A stable figure shows that a situation will last for a while, while a Mobile figure shows a situation will soon change. The Four Triplicities give wider information about the querent and the question asked. The First Triplicity is made up the First Mother, the Second Mother and the First Niece. This Triplicity represents the querent, his or her health, habits and outlook on life. 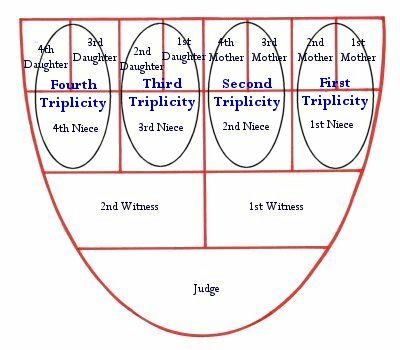 The Second Triplicity is made up the Third Mother, the Fourth Mother and the Second Niece. This Triplicity represents the current events affecting the querent. The Third Triplicity is made up the First Daughter, the Second Daughter and the Third Niece. This Triplicity represents the querent's environment, home or workplace or current place. Family and housemates can be found here. The Fourth Triplicity is made up the Third Daughter, the Fourth Daughter and the Fourth Niece. This Triplicity represents the querent's friends, partners and associates as well as those who wield authority over the Querent. On the Geomantic Shield you can see that the Triplicities form vertical groups from right to left across the shield. A figure will often occur in more than one house. In this case it is considered to have "passed" to the other house. This new house will add a little extra information to the reading in relation to the original figure. Occupation occurs when the same geomantic figure appears in the house of the querent (1st house) and the house of the quesited. If this occurs the answer is Yes. If the figures are favourable then the querent will be happy with the outcome. If the figures are unfavourable then the querent may be ultimately regret the outcome. Conjunction occurs when the same geomantic figure as the querent appears in the house right next to that of the quesited (or vice versa). If the same figure as the querent passes to a house next to the quesited, this means the answer is Yes, but you will have to work for the desired result. If the same figure as the quesited passes to a house next to the querent (2nd or 12th), this means the answer is yes, and no effort is necessary by the querent. Mutation occurs when the figures of the querent and the quesited appear next to each other somewhere else in the chart. This means Yes, but you need to be prepared to explore unexpected paths. The clue to these paths lie in the houses where the mutated figures lie. Translation occurs when the same figure appears both next to the house of the querent and next to the house of the quesited. This figure is different from the significator of the querent and the significator of the quesited. Translation is positive but shows that outside help is necessary and the querent cannot bring about the success by his or her own efforts alone. If the transalted figure is unfavourable then the querent may undergo unpleasant experiences before succeeding. Lack of relationship between the querent and the quesited reveals the answer is No, especially when the Witnesses and the Judge are unfavourable. Astrological aspects can be used in a geomantic chart if one of the significators is first passed to another house and then comes into aspect with the other significator. Sextile (one house between them) adds a favourable element to the reading. Square (two houses between them) adds an unfavourable element to the reading. Expect some trouble. Trine (one house between them) adds a favourable element to the reading. Opposition (five houses between them) adds an unfavourable element to the reading. Expect some trouble. Only these pairs can be used, you cannot read the 2nd and 3rd houses together, or the 4th and 5th etc. Look at the significators of the querent and the quesited to see if there is company between them and its paired house. The company of the querent reveals information about the querent's associates, friends and family members. The company of the quesited reveals information about the people who are associated with the issue in question. If there is no company, then it means that other people are not deeply involved in the issue. A further refinement is that the odd-numbered house in a company reveals the present, and the even-numbered house reveals the future. Thus if the significator is in the even-numbered house, it will not be affected by the companion in the odd-numbered house. When company exists between two figures, you can combine the figures to create a new figure that reveals how this company affects the situation at hand. Company simple occurs when the two paired houses share the same figure. Company demi-simple occurs when the two paired houses share a figure which is ruled by the same planet. For example, Acquisitio and Laetitia are both ruled by Jupiter. Company compound occurs when the two paired houses are occupied by opposite figures (as shown in the table below. Company also occurs when the two paired houses are occupied by figures that have the same top line (head). If the reading simply makes no sense at all, no matter what you do, you have the option of adding together the figures in the 1st and 4th Houses to create a brand new Right Witness, and adding together the figures in the 7th and 10th Houses to create a brand new Left Witness. From these new Witnesses, you can create a new Judge. If even this fails, as a last resort, you can add together the figures in the 1st and 5th Houses to create a brand new First Mother. Add together the figures in the 2nd and 6th Houses to create a brand new Second Mother. Add together the figures in the 3rd and 7th Houses to create a brand new Third Mother. Add together the figures in the 4th and 8th Houses to create a brand new Fourth Mother. Calculate new Daughters and Nieces, Witnesses and Judge again from these new Mothers. Go to Franz Hartmann's Geomantic Techniques including the Astronomical Geomancy of Gerhard of Cremona.